When you think about common fish that serve a wide array of purposes, minnows might not cross your mind – but they should. Whether you are keeping pet minnows or starting a business raising minnows for bait, it’s important to understand the feeding habits of minnows both in the wild and in captivity. Minnows are any small fish that belong to the family Cyprinidae. In the wild, these fish eat a variety of things, including insects, crawfish, brine shrimp, plant material and fish eggs. Minnows kept in captivity eat algae, phytoplankton and zooplankton from their tanks or ponds. They also eat commercial fish food, including minnow food, catfish food and tropical fish food. It is a good idea to supplement commercial food with dried bloodworms or brine shrimp. Some people call any small fish a minnow while others think “minnow” is probably a species name. Neither of these common beliefs is accurate. The term “minnow” refers to an entire family of fish called Cyprinidae. Species that belong to this huge family include stonerollers, fatheads, chubs, fallfish, carps, shiners and daces. 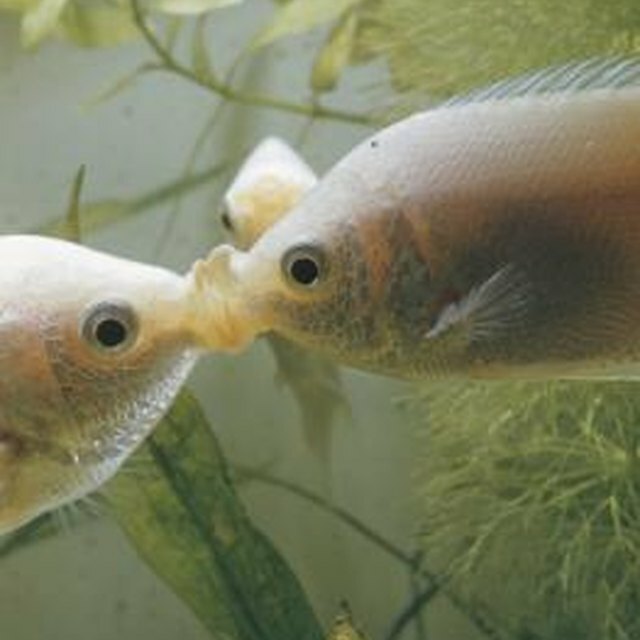 Because the Cyprinidae family is so large, the natural feeding habits of minnows vary widely. In the wild, minnows eat insects, insect larvae, even smaller fish, crawfish, brine shrimp, algae, phytoplankton, zooplankton, fish eggs – their own and those belonging to other fish – and even tiny bits of dead animal matter. Feeding minnows in captivity is quite different. Some minnow breeders and people who keep minnows in ponds allow their fish to feast on the algae and phytoplankton that grow in the tanks or ponds. Adding a small amount of high-phosphorous plant fertilizer (1 to 2 tablespoons per 100 gallons of water) stimulates algal growth and phytoplankton blooms. Captive minnows also eat commercial food, preferably high-protein (36 percent or more) minnow food or catfish food. It is important to select food that comes in grains or flakes small enough for the minnows to eat. In a pinch, you can crush pellets so minnows can consume them more easily. The most readily available fish food is tropical fish food or goldfish food from the pet store, which is a good substitute when supplemented with freeze-dried bloodworms or crushed brine shrimp. The most important consideration when it comes to feeding minnows is quantity because overfeeding is one of the most common causes of death in captive minnows. Minnows should receive the amount of food they can consume in 10 minutes each day, but it is better to break this into twice daily feedings. If you feed minnows twice a day, the food should disappear five minutes after feeding. If the minnows consume all the food within only two or three minutes, offer more food. Whether you are considering breeding minnows for bait or keeping them as pets, understanding minnow feeding habits is crucial to your success. Mayer, Melissa. "What Do Minnows Eat?" Sciencing, https://sciencing.com/what-do-minnows-eat-4744268.html. 07 May 2018.